The last person in the galaxy Kirk would want to see again. As a show from what was, essentially, still the early days of television, Star Trek didn’t have much in the way of recurring characters. We had Nurse Chapel and Yeoman Rand, as well as a few reused extras who eventually gained names (Like “Lt. 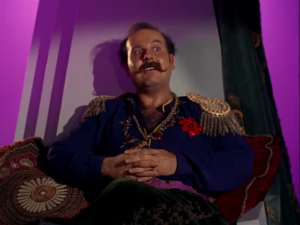 Leslie“), but that was pretty much it… except for Harry Mudd, interstellar con-man and occasional thorn in Kirk’s side. Mudd only shows up in two episodes: “Mudd’s Women” and “I, Mudd,” but he turned out to be a moderately popular subject for pitched episodes. One such pitch went by the name “Deep Mudd,” which acted as a direct follow-up to Harry’s predicament at the end of “I, Mudd” explaining how he got off the planet and ran across the Enterprise again. According to the screenwriter (Stephen Kandel, who wrote Mudd’s other prior appearances), Harry Mudd fools the androids of the “I, Mudd” planet into thinking he’s been rehabilitated by aping Spock’s mannerisms, and tricks them into revealing a hidden cache of ancient weapons left behind by the android’s creators. Using this promise of treasure, Mudd manages to get rescued by a crew of space pirates, but quickly finds himself out of his depth and winds up dragging Kirk and company into the situation to bail him out once more. Sounds like a perfectly good episode of the original series, doesn’t it? So why wasn’t it made? Not many small parts grow to have an entire episode dedicated to them. “Who’s Sito Jaxa?” you might ask. You’d be forgiven for not remembering her name; she was one of the four guest stars who took the focus in “Lower Decks,” a TNG episode (after appearing in “The First Duty” as a classmate of Wesley’s). 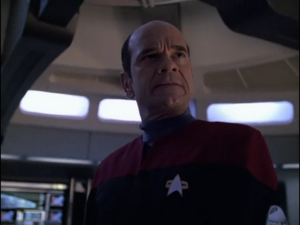 At the end of the episode, Sito Jaxa, a Bajoran, was sent on a dangerous mission alongside a Cardassian who was secretly working with the Federation. 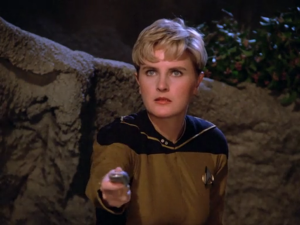 Spoiler alert, but the episode ends with the discovery of a destroyed escape pod and her presumed death. While early on, writers were adamant that her death was necessary for the story to work, after it was shot, they found themselves exploring ways to bring her back. 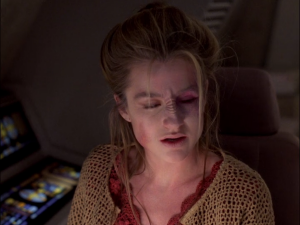 Instead of her being killed, Jaxa would’ve been captured by the Cardassians and held prisoner for several years, eventually escaping or being rescued after she’s forced to kill her friend/cellmate; much of the episode’s plot would’ve dealt with a return to ordinary life after living the stressful and difficult life of a prisoner for so long, something that DS9 later did with Miles O’Brien in “Hard Time.” The idea of dealing with themes of PTSD also went on into “It’s Only a Paper Moon,” with Nog’s inability to cope and retreating into the holosuites. The episode was primarily worked on for DS9 by Robert Hewitt Wolfe, who went on to run Andromeda. Why wasn’t it made? If you ask Ronald D. Moore, it’s because they didn’t want to taint the ending to “Lower Decks,” which was already a fan favorite even before DS9 touched it. A similar situation arose with “Defiant” and its return to the fate of Thomas Riker from TNG; one wonders if at some point the two might have been held at the same detention facility. There’s also the fact that, as DS9 became more serialized, taking time out for side characters from TNG meant less opportunity to develop their own characters and plot, potentially explaining the move to take the basics of Jaxa’s story and transplant them to an “O’Brien Must Suffer” episode. If this Sito Jaxa episode had been made, “Hard Time” presumably would not have. Evil Chakotay above, Captain EMH… who knows what other crazy universes we’d have seen? Quite a title, isn’t it? Voyager usually kept episode titles pretty short, so this would’ve almost certainly been changed, but it does give a really provocative story concept right off the bat. This is pretty fun because it was originally created by Bryan Fuller, a man who’s now in charge of the upcoming Star Trek: Discovery series. Among unproduced Star Trek episodes, it’s certainly one of the more interesting to think about. There’s no reason given as to why this wasn’t developed; cost may’ve been part of it, or it may simply not have captured the other writers’ attentions enough to maintain momentum. But who knows? Perhaps Fuller will pull this idea out and dust it off for Discovery. In one rewrite, “Blood and Fire” became Tasha-focused. Might it have convinced Crosby to stay? And now we’re at the big one. TNG was just getting started in the mid 80’s, and several members of the original series’ writing team ended up getting involved in it helping it off the ground. Among them was David Gerrold, writer of “The Trouble with Tribbles” and a few other scripts. 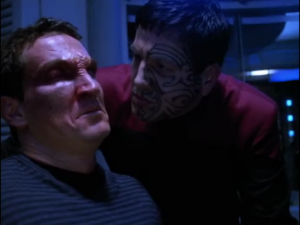 Most Star Trek fans like to think of Trek as a very progressive show, touting moments such as the “first scripted interracial kiss” on TV and the general treatment of race (“Let That Be Your Last Battlefield”) and nationality in TOS as proof. Heavyhanded, certainly, but always pushing boundaries to be on the right side of history. Gerrold, then, wanted to continue to push the boundaries in TNG, and decided to tackle one of the biggest social issues in the 80’s–the AIDS epidemic, and the fear and ignorance in the public regarding the disease. Out of this came the script “Blood and Fire,” dealing with an outbreak of Regulan Bloodworms. Regulan Bloodworms are incredibly infectious and kill within hours, leading to a standing order from Starfleet to eradicate any station or ship that has come in contact with them. An away team goes aboard a derelict ship and thus have their lives put at risk as a result of trying to help. Instead of killing them or resigning them to their fate, the entire ship donates their blood to help them recover, showing that there’s no reason to fear the victims of a terrible disease. The episode would also have included the first canonically gay couple as minor characters whom Riker speaks to, something that didn’t happen in Star Trek until THIS YEAR as a result of “Blood and Fire” getting canned. As it turns out this script led to a huge shitstorm over at the studio. According to Gerrold, Rick Berman was the most fervently against it, citing fear over “Mommies writing letters,” which Gerrold felt would be a good thing. After all, the aforementioned Uhura/Kirk kiss certainly got a lot of angry letters. Gerrold claims Berman was quite homophobic in reality, at least at the time, which may explain why Trek under his hand never did get around to LGBT characters… but that’s another issue entirely. Of all the unproduced Star Trek episodes out there, this one definitely has the most potential to change things. It represents a metaphorical battle for the soul of the franchise at a point when it wasn’t really sure where it was going; had Gerrold won out and “Blood and Fire” been made, it would’ve put TNG back on the map in terms of dealing with social issues and pushing the envelope with progressive ideas. While TNG eventually did get around to some of this, it was never as ingrained in the TNG-era series as it was in TOS, and we have no idea what was lost as a result. That’s all for this week. You can check out other unproduced Star Trek episodes on Memory Alpha. Any of these episodes, or even the ones on Memory Alpha, that you really wished had been made? Let me know in the comments, or on Twitter @RetroPhaseShift. If you have ideas for future “What Could Have Been” articles, share them, and I’ll see what I can do! Thanks! I know you’ve been following for a while, and I appreciate it.